Stefano Ricci sweater with tonal eagle embroidery. Etro sweater with paisley shoulder details. Crew neckline. Straight hem. Wool. Made in Italy. Model's measurements: Height 6'1"/185cm, waist 32"/81cm, typically wears size M.
John Varvatos Star USA sweater with velvet detail. Crew neckline. Straight hem. Wool/acrylic. Imported. 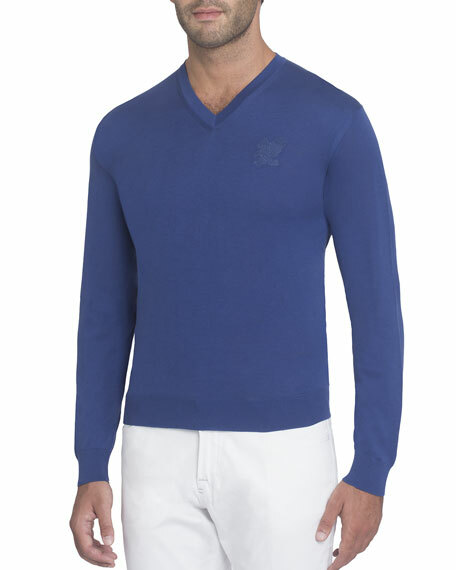 Model's measurements: Height 6'1"/185cm, waist 32"/81cm, typically wears size M.
EXCLUSIVELY AT NEIMAN MARCUS Neiman Marcus soft knit sweater. Ribbed neckline, cuffs, and hem. V neckline. Long sleeves. Pullover style. 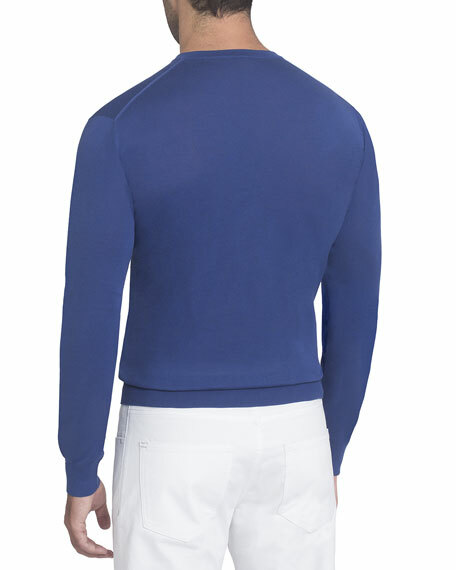 EXCLUSIVELY AT NEIMAN MARCUS Neiman Marcus soft knit sweater. Ribbed neckline, cuffs, and hem. V neckline. Long sleeves. Pullover style. Classic fit. Cashmere/silk. Imported. Model's measurements: Height 6'1"/185cm, waist 32"/81cm, typically wears size M.